I love vegan red velvet cake! It’s dense, chocolatey, and just a little bit tangy. Vegan cream cheese frosting is always a favorite, the two together are simply divine. This cake has one more element that takes the flavor combination to the next level. We’re talking sweet, salty, vegan red velvet cookie crumbles with macadamia nut pieces! I started baking naked layer cakes last year for my wedding. Well, first, I tried to make one without a mold, and it turned into a sad pile of delicious slop. It was such a mess that I put the whole thing in a bowl, topped it with more frosting and called it “Bowl Cake.” I needed a new approach. I was browsing Pinterest one day for wedding inspiration when I came across these delightful cakes by the bakery Momofuku in NYC. They are kind enough to provide recipes on their website, which include easy to follow instructions on how to make a naked layer cake that is tall, sturdy, and damn near perfect every time. With only a spring form pan, and two sheets of acetate (plastic sheets) you can make a mould for a cake with such smooth, clean edges, it looks professionally baked. Hallelujah! Finally, a cake recipe that wouldn’t result in another “Bowl Cake.” The assembly and style of Momofuku cakes are quite impressive, but they are full of eggs, milk, and some even include gelatin. I made it my mission to create healthier versions of these cakes using entirely plant based ingredients. While this vegan red velvet cake isn’t completely healthy, it is made with whole wheat flour and mostly coconut oil. It could be worse, y’all! One thing to note is that red food coloring is typically made from beetles, it is not vegan. Most health food stores will carry vegan food coloring, or you can find it online. Once you get the hang of these cakes, they are so easy to make. Really only an hour of active time, which for the final result, is pretty sweet! Start by making the cookie pieces. While they are in the oven, prepare the cake batter. Then while the cake is in the oven, make the frosting. After the cake cools (I usually pop mine in the freezer for a few minutes to speed things up), the assembly takes only 5-10 minutes. Not bad! 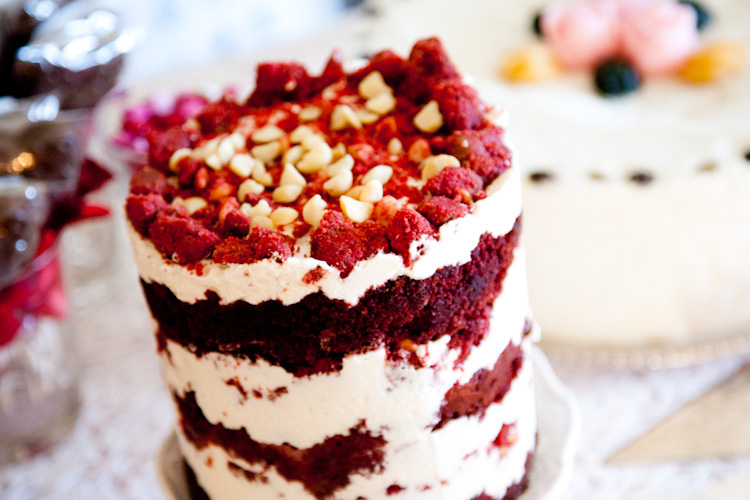 An impressive naked layer caked filled with cream cheese buttercream, red velvet cookie crumbs, macadamia nuts and rich red velvet cake. Perfect for any celebration! Combine the flour, sugars, baking powder, salt, nuts, and cocoa in a large stand mixer bowl. Mix on a low setting until even. Add the vanilla, vinegar, red coloring, and oil to the dry mixture, stirring constantly. The cookie dough should look crumbly like clumps of sand. If it seems to doughy, add flour by the tablespoon until it looks crumbly. Bake at 300 degrees for 11-13 minutes. Let the crumbs cool completely before using them in the cake. They will keep fresh for 1 week at room temperature or 1 month in the fridge or freezer. Heat the oven to 350 degrees. Grease a 9×13 baking pan with a bit of coconut oil, then line the bottom of the pan with parchment paper. Combine the flour, sugar, cocoa powder, baking soda, and sea salt in a stand mixer bowl. Use the low setting for 10-20 seconds, until even. Keeping the stand mixer on low, slowly add non-dairy milk, oil, and red coloring until just combined. Stop to scrape down the sides of the bowl, then add the vinegar and mix for 10-15 more seconds on low. Cream together the vegan shortening and vegan cream cheese using a stand mixer with a paddle attachment or a hand mixer set to high. Reduce the speed and slowly stream in the remaining ingredients. Turn the speed back up and beat for another 2-3 minutes until the frosting is super fluffy. Will keep up to 5 days in the fridge. Place two sheets of acetate or laminate into the cake pan as shown. You are creating a tall mold to shape your cake in. Tape the sides of the sheets together to form your sturdy mold. Combine the milk and vanilla extract. This will be your milk soak. Use the remaining scraps to fill in the bottom layer. Shove the pieces into the middle, and tamp it down a bit with the back of your hand. You may have a few bites left over to munch on! Slowly and evenly, pour half of the milk soak on top of the bottom layer. Spread ⅕ of the cream cheese frosting on the layer. Cover the frosting with ⅓ of the cookie crumbles. Spread another ⅕ of the frosting on the crumbles until they are covered, especially around the rim of the cake. It will be visible so you want it to look even and gorgeous! Add a full cake circle into the mold, then evenly pour the remaining milk soak onto the cake layer. Spread ⅕ of the frosting on top of the layer, followed by ⅓ of the cookie crumbles and an additional ⅕ of frosting. Add the final layer, then cover it with the last ⅕ of frosting. Use the remaining cookie crumbles to decorate your cake in whatever design or fashion you like. Cover the finished cake in a few secure layers of plastic wrap and freeze overnight to set the cake. After 4 hours, or ideally overnight, set the cake out to thaw on the counter or in the fridge. An hour or two before serving, remove your cake from the freezer. Pop open the spring form latch to release the cake from the pan, and remove the bottom circle of the pan from the cake. Place the cake on your cake stand or cake plate. Peel away the laminate sheets, and VOILÀ, you have a vegan red velvet cake that is whole wheat and animal friendly! Bake one for yourself and more to share with friends and family! So sorry about that! I had some formatting issues when switching to this new recipe layout. The frosting section has been updated, thanks for pointing this out! Hope it wasn’t too much of an inconvenience for you. Hi! This cake is beautiful. This recipe as printed leaves out baking instructions. No amount of baking time etc. Please add this; I want to make this for my daughter in law’s baby shower tomorrow!